The TDA8591J is a quad BTL audio power amplifier comprising four independent amplifiers in Bridge Tied Load (BTL) configuration. Each amplifier has a gain of 26 dB and supplies an output power of 75 W (EIAJ) into a 2 Ω load. 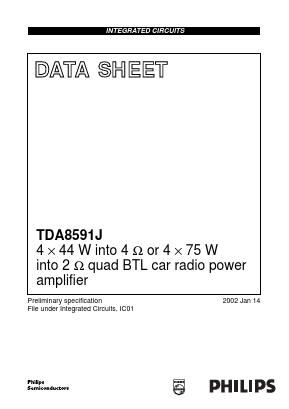 The TDA8591J has low quiescent current and is primarily developed for car audio applications. TDA8571J 4 Ã 40 W BTL quad car radio power amplifier View NXP Semiconductors.